“He is risen!” is a rich declaration that assumes Jesus died but is alive again. Early Christians would greet one another with this simple declaration and respond with “He is risen indeed!” Children can maintain this tradition with this He Is Risen! greeting card with cross image and an excerpt from Acts 13:30. 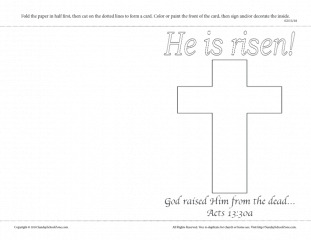 Kids or parents can write the response, “He is risen indeed!” on the inside of the card to complete the greeting.